The Orbee-Tuff® Ringo is a celestial offering from the Cosmos collection. Orbee-Tuff® Cosmos are stellar orbs floating around your pup's Slobber System. 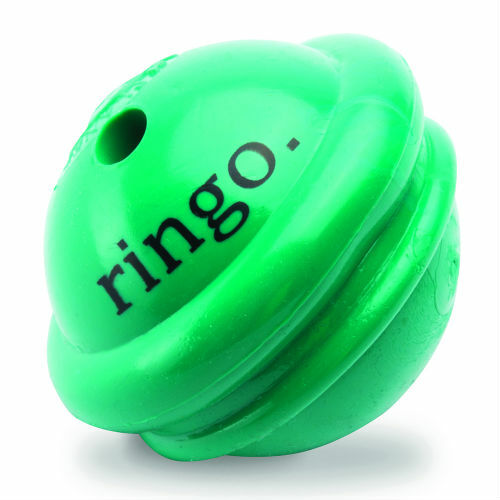 The Ringo features a Saturn-like ring for some other-worldly bounce. With the Cosmos line, the sky's the limit! At 3", it's perfect for most dogs, and rates 5 out of 5 chompers on our Durability Scale. Its unpredictable bounce will have avid star-chasers flying high. Like all Orbee-Tuff® toys, GuRu is made in the USA, non-toxic, durable, bouncy, chewy, buoyant and always 100% guaranteed.